Our professional gas fitters offer services covering all of your gas fitting requirements; whether you have no hot water, a gas appliance to be installed, serviced or replaced, a BBQ converted to natural gas or you suspect a gas leak. 23 Hour Plumbing cover all metropolitan areas of Adelaide, Melbourne, Perth, Brisbane. We can have a local plumber to your location within the hour* in an emergency 24/7, including all public holidays. We come to you with a fully stocked van providing a prompt, reliable and affordable plumbing service. We come to your home or business and we understand Gas Emergencies happen when you least expect it. We are available at all times of the day and night 24/7 to assist you with your gas fitting needs, installations, afterhours and emergency repairs. Did you know that most serious gas related health emergencies in Australia occur within the home, often with the people affected being totally unaware of anything wrong. Gas can be a silent killer. Natural gas is now given a sulphuric odour, making it easier to trace and recognise faults, but this is not always the case, sometimes both natural gas and LPG are not traceable with an odour if faults are present in your appliances or pipes. You need to be rest assured your gas appliances such as heaters, ovens and cook tops are all fault and leak free to ensure the safety of your family. It is recommended to have your gas appliances serviced according to manufacturer’s instructions, or at least once every two years to reduce the risk of Carbon Monoxide poisoning. 23 Hour Plumbing can assist with all of your gas appliance maintenance needs. High levels of Gas inhalation (Carbon Monoxide) can cause loss of consciousness, which is how, tragically, death can occur with people unaware they are inhaling the deadly silent gas. Often happening when people are asleep and in bed. It does not take long for poisoning and loss of consciousness to occur. Don’t put your family at risk – Call us today on 1300 070 399 to book your qualified Gas Fitting plumber with 23 Hour Plumbing. DIY with gas fitting is not something you want to risk when it comes to the health of your family, your neighbours, and of course, yourself. 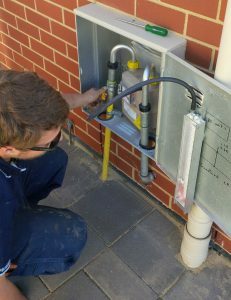 Leave it in the hands of one of our professional and qualified gas fitting plumbers available to you at any time – Call us today on 1300 070 399 to book in your gas fitting and repairs. You might have experienced higher than normal gas bills? This is a good indication something is not right. All signs you need to turn off your gas to the property, start ventilating and call us at 23 Hour Plumbing on 1300 070 399 so we can ensure that your home is safe and sound and free from the risk of poisoning, or a gas explosion. Gas’s main use is to burn, so of course the risk of gas fire in your home or business is high if you have a leaking gas pipe, cooktop or oven, or even heating. Don’t risk it – Call us today. The devastation fire can cause to your home, business and all of your personal belongings and assets is invaluable. All of our Gas fitting plumbers are fully qualified. We can also calibrate and certify all of our Gas fitting work. All of our plumbers and gas fitters in Adelaide, Perth, Brisbane and Melbourne operate within the strict Australian Standards guidelines. We can provide certificates of compliance for all of our Gas Fitting and Installation work. Did you know if your gas fitting work is not completed by a qualified gas fitter, your warranty or insurance claims may be void? Your cost cutting by trying to DIY may result in costing you more money in the end! So what are you waiting for? Give 23 Hour Plumbing a call today and book one of our Gas Fitter on 1300 070 399.